Non-stoichiometric minerals have a chemical composition that cannot be expressed by a nominal cation to anion ratio. 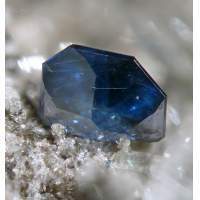 The excess or deficiency of ions in these minerals is commonly due to extrinsic vacancies that result from the substitution of cations in different valence states. The vacancies are invisible as long as they are isolated but become observable in the transmission electron microscope once they cluster or order into specific crystallographic directions or planes. The ordering of vacancies results in the formation of defect clusters or superstructures in minerals that greatly alter, in particular, magnetic and transport properties (diffusivity, conductivities) of minerals. This chapter surveys structural modifications in the non-stoichiometric minerals pyrrhotites (Fe1–xS), wüstite (Fe1–xO), rutile (TiO2), and perovskites (ABO3–x). The examples provide an instructive overview of how both cation deficiency and cation excess are accommodated by common crystal structures relevant to geoscience.